The current edition of the Jewish Chronicle has yet another piece by the paper’s political editor Martin Bright attacking the East London Mosque. Entitled “Jihad and Jews don’t go together”, this is just the latest installment in the JC‘s obsessive (and so far entirely futile) campaign to destroy the relationship between community organisers London Citizens and ELM (see here, here, here, here, here, here and here).​ An outraged Bright relates the shocking news that Rabbi Jonathan Wittenberg of North London Synagogue “agreed to take part in a ‘multi-faith peace procession’ alongside the chairman of East London Mosque, Mohammed Abdul Bari”. 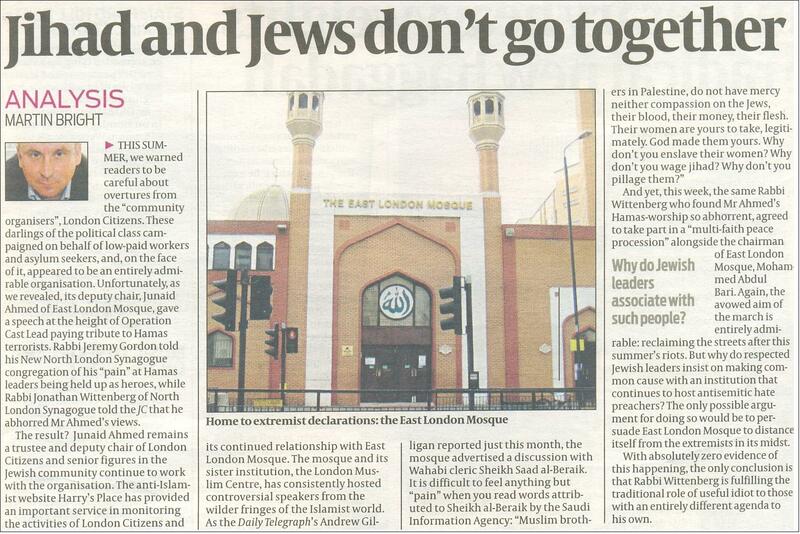 While the print edition of the JC features Bright’s article denouncing Rabbi Wittenberg for daring to participate in a community procession with Dr Bari, the paper’s website carries a report by Jennifer Lipman that gives favourable coverage to the role of the Joseph Interfaith Foundation’s Council of Imams and Rabbis in presenting a joint Jewish-Muslim response to the English Defence League. In an admirable letter to the home secretary the council expressed its concern about the EDL’s attempts to “incite hatred and antagonism in our society” and “drive a wedge between the Jewish community and our Muslim neighbours”. Yet among the “organisations which we regularly cooperate with” listed on the Joseph Interfaith Foundation’s website we find … the East London Mosque. A recent example of such cooperation was seen during Inter Faith Week last month, when the Council of Imams and Rabbis and ELM jointly held an event for local mosques and youth organisations at the London Muslim Centre, entitled “Meet the Rabbis and Ask Questions”. It took the form of a seminar consisting of a short introduction about Judaism followed by a Q&A session with a panel of rabbis. How long, you wonder, before Bright and the JC extend their vicious witch-hunting to Mehri Niknam? As evidence of ELM’s extremism Bright refers JC readers to fellow witch-hunter Andrew Gilligan’s sloppily researched piece on his Telegraph blog attacking the mosque for hosting Sheikh Saad al-Beraik. This accusation against ELM is based on a single, decade-old quote from the Saudi Information Agency, which is hardly a reliable source, being a dubious website run by a Saudi dissident – though Bright doesn’t mention this, allowing his readers to assume that the quote is from an official Saudi government website. Furthermore, during his visit to the UK Saad al-Beraik also spoke at the London Central Mosque in Regent’s Park, where he led the Jumma prayer and delivered the khutbah. Unsurprisingly, given its close links to the Saudi embassy, appearances by such “Wahabi clerics” are hardly unknown at the London Central Mosque. Yet that hasn’t prevented the Board of Deputies of British Jews from attending interfaith events there. Can we take it that the BoD too is going to be denounced by the JC for associating with an institution that hosts “controversial speakers from the wilder fringes of the Islamist world”? The idea of the JC witch-hunting the Joseph Interfaith Foundation or the Board of Deputies might appear far-fetched, but since his appointment as the paper’s political editor Bright has made a speciality of persecuting members of the Jewish community who refuse to boycott Muslim organisations and individuals of whom he disapproves. Earlier this year the JC published a front page article accompanied by an op ed from Bright attacking the prominent Jewish philanthopist Trevor Pears for funding the organisation Forward Thinking, which had hosted a meeting at the House of Commons featuring a so-called “jihadist” named Tafazal Mohammad. Bright’s accusations against Tafazal Mohammad were shown to be baseless and the JC was forced to publish an apology. The bottom line here is that Bright is intent on discrediting and marginalising organisations that support the Palestinian cause. However, if Jewish leaders are to boycott Muslims who sympathise with the Palestinian resistance, as Bright demands, then Muslim organisations could equally well refuse to cooperate with Jews who continue to support Israel despite its acts of state terrorism against the Palestinian people. If the Israel-Palestine conflict is allowed to determine relations between Jews and Muslims in the UK, then interfaith initiatives become almost impossible. Bright is quite happy to poison relations between the Jewish and Muslim communities because he isn’t a member of either and doesn’t have to live with the consequences of his inaccurate and irresponsible journalism. His approach does play well with the likes of Melanie Phillips, of course, but more thoughtful members of the Jewish community must surely question the damage done by Bright’s use of the JC as a platform to pursue his malicious campaigns against representative Muslim institutions.